This movie which reached close to a million views within the first few months of release serves as a comedy that parodies the Islamic laws of polygamy. 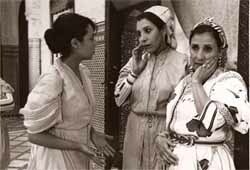 The main character Hadj is married to three women from different generations who get along quite well and have created a system in which each woman is responsible for specific wifely duties. Everything seems to be working out comfortably until Hadj gets upset and throws the youngest wife out. He decides that he made a mistake and wants her back but Islamic law states that he cannot remarry her back until she gets married again and then her husband has to reject her.